442 foot frontage on Norton Creek, which feeds Lake Glenville. Fully furnished 4br/2ba and queen sleeper sofa accommodate up to 10 guests. Gas log fireplaces both inside and outside. Huge 625 sq ft, high ceiling, screen porch with conversation pit configured furniture. Screen porch is surrounded by over 1000 sq ft of expansive deck. Pastoral view across large lawn to 10th green of Trillium golf course beyond Norton Creek. Volley ball equipment available. Photos tell it all. Conveniently located on Norton Road between Cashiers and Highlands for dining and shopping. Every vacation activity you can imagine with the possible exception of skydiving can be experienced in the Cashiers/Highlands/Sapphire Valley areas. We keep a limited library of local activities brochures on hand. Also recommend you visit the Cashiers Chamber of Commerce for more activity brochures. In Cashiers take US Hwy 64 west at the intersection of NC Hwy 107. Also known as the "Crossroads." 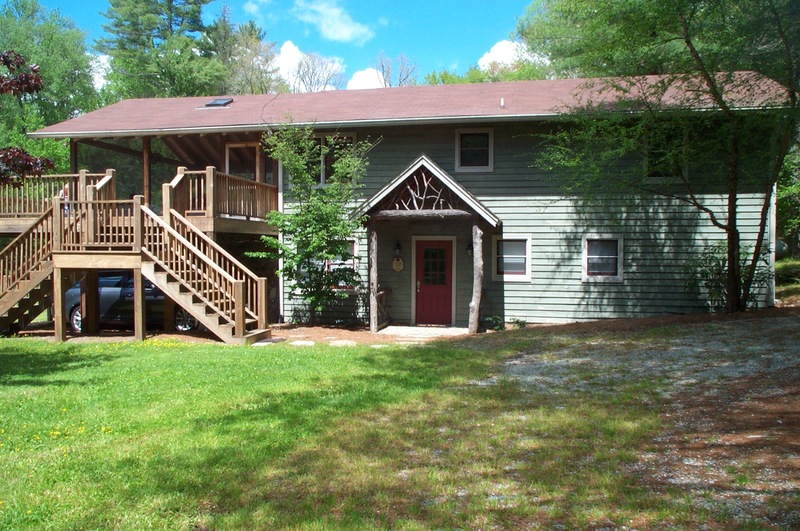 Nestled high in the Blue Ridge Mountains convenient to Cashiers, North Carolina and Lake Glenville, Acclaimed Haven Lodge provides an excellent destination for a perfect family vacation. Come here to experience local culture, excellent live music and rugged natural beauty. Explore the mountain trails of Gorges State Park by foot or bicycle. Go rock climbing or whitewater rafting. Bring your binoculars and see glimpses of elusive birds and wildlife. During the winter months, the mountain slopes are perfect for sledding and snowshoeing. And when the summer arrives, the same hills bloom with wildflowers. After an exhilarating day of outdoor activity, lakeside fun and breathtaking views, come back to town to play a round of world class golf. Cashiers and the surrounding town are also great places to learn about Blue Ridge Mountain heritage and history. Explore the Oconaluftee Living History Village in Cherokee to see demonstrations of Cherokee life, or visit the Mountain Heritage Center and learn more about the area's early Scots-Irish settlers. Here are a few specific suggestions to help you plan your trip to Cashiers:- Explore downtown Cashiers: Stroll the downtown area and visit the charming antique shops, art galleries and craft shops, several of which are owned by working craftspeople and local artists.- Experience the music: Come in July for the annual Cashiers Mountain Music Festival and witness a gathering of the most talented bluegrass musicians in the Blue Ridge Mountains.- Play on the lake: Explore Lake Glenville, a high mountain reservoir with 1400 picturesque acres perfect for boating, swimming and fishing for walleye and trout.- Go horseback riding: Saddle up and explore the trails of the beautiful Blue Ridge Mountains on horseback.- Go skiing and snowboarding: Play all day on the pristine powdery slopes of Sapphire Valley, a popular skiing and snowshoeing area close to Cashiers.- Hike to the waterfalls: There are 19 spectacular waterfalls within hiking distance of the Cashiers area, including Whitewater Falls, one of the tallest in North America.